Visual journalist Susana Giron shares her project “Unlimited Youth,” a documentation of the 2018 World Masters Athletics in Malaga, Spain. 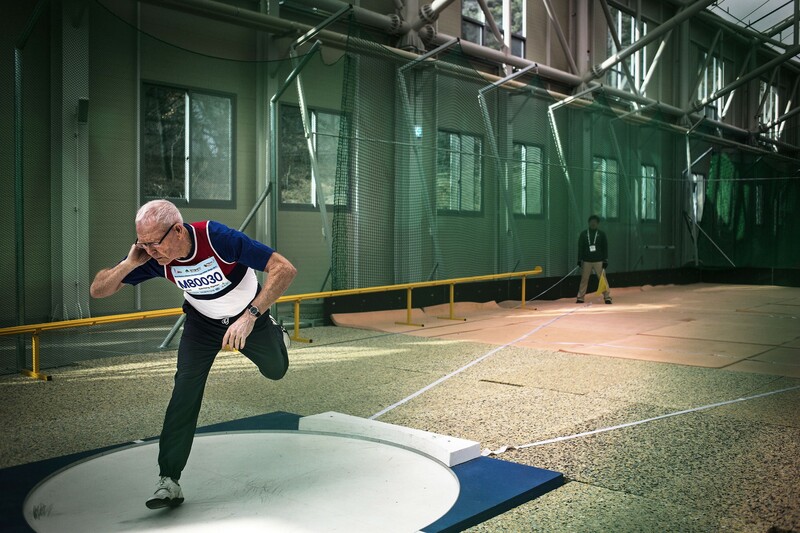 The 2018 World Masters Athletics saw more than 8200 athletes from 101 different nationalities take part in the official competitions. 25% of these athletes were older than 65 years old. The oldest ones, the Italian Giuseppe Ottaviani 102 years-old or the Indian woman Man Kaur 101 years-old, were the most extraordinary cases within a fascinating group of people that keep training and competing during the third age. The great majority began training at the age of 40 or 50 looking for a healthy lifestyle. But now, beyond the marks or records, competition is also an opportunity for traveling, making friends, keeping the illusion for life and getting older in a healthy way. 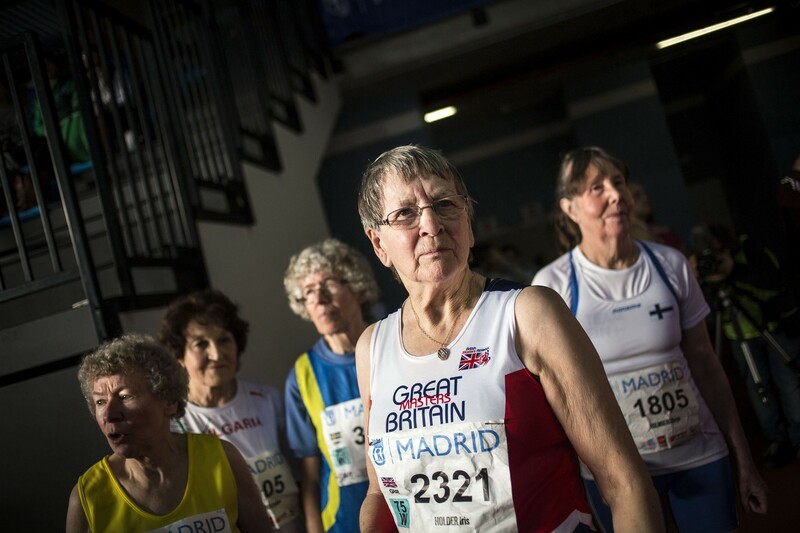 They are just a group of elder people, that run quite fast, throw really far and jump incredibly high, but far from that they are an example for society, where values like effort, passion, determination or will not only belong to sport values but to human values too. Promoting what they do, on the one hand, will make people realize these inspiring activities, and on the second hand will give more value to elders in society, a group of age, that tend to be undervalued. “I have met a lot of masters athletes and many of them are my friends now,” Susana recalls, “so when I am photographing them during competitions I feel especially involved because I know the big effort and illusion that is hidden behind that race or jump. Many special moments come to my mind. One of the most special moments was with the Spanish masters Athlete Teresa Liras, who is 67 years old. She was diagnosed with cancer in early 2016 and was operated on a few weeks later. Due to the surgical operation, she could not move her right arm very well and the doctors advised her to rest. However, she decided to take part in the Madrid Masters Athletics Championship using her left arm, and she could make a mark of 6,05 meters. 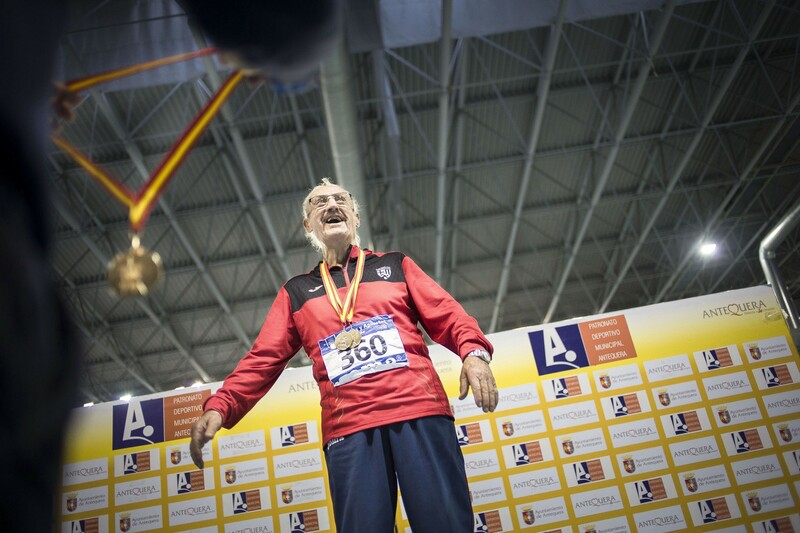 I remember a Polish 77-year-old master athlete who competed in the cross-country race (10 km countryside) at Ancona European Master Athletics Championship –– she was barely was able to walk. I remember her hands and fingers deformed by osteoarthritis. Despite this, she finished the race even though medical services tried to convince her to leave the race. Instagram Story curated by Kyla Woods. Visuals by Susana Giron. Ms. Giron first began to photograph this project in 2015. “Since then, I have been documenting and shooting in several International competitions (Two world masters Athletics in Daegu and Malaga, Two European masters Athletics in Ancona and Madrid and five Spanish Masters Athletics championship in Elche, Madrid, Salamanca, Antequera). I have also been following several masters in their daily training. I am still motivated to continue working on this project, and every time I try to look for new approaches to the topic. I am recording video and making interviews as well and photographing staged portraits during the competitions. I want to follow this story at least one year. I want to create a documentary film and photo book about this. Susana Giron is a documentary photographer based in Spain. She has a degree in Photography and Visual Arts from Miguel Hernandez University. She works for international media and has been published in GEO, Stern, El Pais, El Mundo, Terramater, Days Japan, CNN, La Nación, Polka Magazine, among others. She was also shortlisted for the SONY World Photography Awards in 2012, IPA Awards in 2012 and 2014, Photoespaña Ojo de Pez 2013 and VISA de la Ani Pix Palace 2014. She was the winner of the Phototraballo International Grant 2012 and the National Award in Photojournalism “Doñana” 2013. Kyla Woods is an established community manager, content curator, visual educator, and digital strategist. Since 2016, she has worked at Blink Media.